Ruth had her MRI on Monday, to look more closely at her spina bifida, and also as part of the MOMS study. Since the scan was looking at both her brain and spine, she needed anesthesia. She was npo for about 6 hours before the scan (nothing to eat), and was given iv fluids. She was not happy about not eating! They moved us back to the west wing (sicker babies), so her nurse could go with her. When we got downstairs, the anesthesiologist started preparing her. They took out her ng tube, and used special iv tubing that contained no metal since the mri is a big magnet. 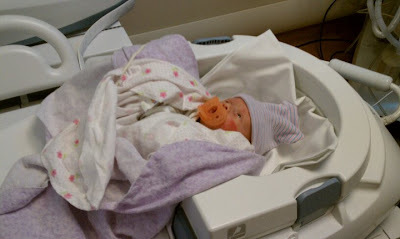 They moved her over to the scan table, and put her to sleep with a gas. At that point I couldn't stay with her, it was extremely hard to leave. After I left they put a breathing apparatus in the back of her throat to deliver anesthesia and help her breathe. They also gave her some anesthesia through her iv. I went and grabbed a quick lunch and waited for her nurse to call once they got back upstairs. When they called me in there, she was very cold and had low saturations and a slow heart rate. She was being warmed on a warming bed (similar to what they put the babies on right after they are born), and had her on "blow by" oxygen. It took her a little over 3 hours to warm up, breathe better, and wake up. Once she woke up, she ate well the rest of the day. She lost about 10 grams that day, not bad since she missed 3 feeds. We didn't get the results for a couple days since we had to wait for the pediatric neurologists to look at it. Her hydrocephilus showed some increase from her fetal mri (done before her prenatal surgery), but are stable and does not indicate the need for a shunt to drain the extra fluid out of her brain, at this point. That could still change, so we will continue to monitor her for changes for quite some time. But it is very hopeful since she does not need one at this point, she may not ever need one! They also commented that she has a very minor Chiari II defect, where the back part of her brain is pulled down towards her spinal column. They did not comment if it was improved, since hers was minor in the first place. The last thing they mentioned was it did show what they call a tethered cord, where her spinal cord attaches to scar tissue from her repair. They commented that this was expected. A tethered cord can cause problems and require a release surgery, but only if it becomes symptomatic. This is something we will watch with her doctors at home. Overall, the results were good. She will have a follow up MRI at one year old, and again at 2.5, as part of the MOMS trial.